EDGE™ E3-V SSD - SATA 6Gb/s, 2.5"
EDGE E3-V SSDs are TAA compliant, built with premium controllers, and backed by a three-year warranty and expert support. Balancing performance and reliability, the EDGE E3-V SSD is a storage upgrade at an exceptional value. Featuring the Silicon Motion controller, E3-V SSDs are loaded with enhancements to promote a dependable computing environment. The E3-V is designed as a direct replacement for traditional spinning disk hard drives. The result is a faster, lighter, more durable, and more reliable storage solution. 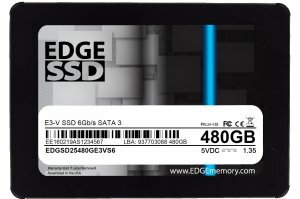 E3-V SSDs can achieve ultra-fast read and write speeds. In comparison to hard drives, this solid state drive can cut system boot times by up to five times. Fast read/write speeds, coupled with a high max IOPS rating, provide fantastic performance gains in boot times, file transfers, and software application loading. A suite of reliability and durability features such as wear leveling, ECC, TRIM, and S.M.A.R.T. further enhance data efficiency and increase the lifespan of the drive. All E3-V SSDs are TAA compliant and come backed by a 3-year warranty* and expert support. ^Complete warranty details can be found here: www.edgememory.com/warranty. High Performance - Ultra-fast read and write speeds - performance gains in file access, application loading and more. SLC cache and external DRAM dramatically boosts speeds in everyday tasks. *Some capacity used for formatting and not available for storage. Capacities are 7% overprovisioned.